50x50mm tanalised floor joists, fully rebated doors and frame, half-glazed double doors, mortice lock & handle, 2 opening windows & diagonal bracing. 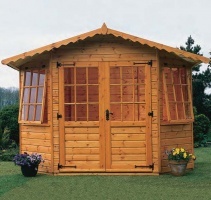 A truly unique chalet which will enhance your garden and enable you to admire the garden from all angles. Available in four glazing options; plain, leaded, modern and small georgian.